REDMOND, OR -- The two candidates running for Mayor in Redmond took part in their first public forum, Monday night, at an event hosted by the Redmond Patriots. 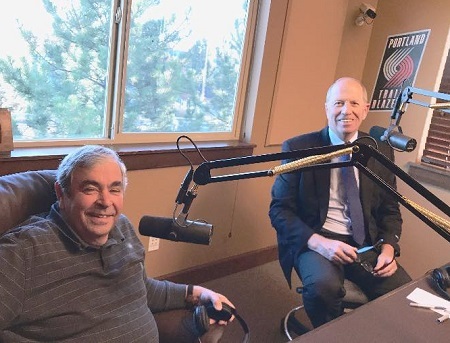 Earlier in the day, incumbent Mayor George Endicott and former mayor Ed Fitch met in their first face-to-face debate, on KBND's Morning News. On housing, Fitch says there’s not enough variety in Redmond’s inventory and he’s worried about what he calls tract housing, "One thing I’ve talked to the staff about is they’ve recommended a number of items that would create neighborhoods – more of a feel of neighborhoods, such as Canyon Rim Village. That advice has gone unheeded at the City Council level." Endicott says the city supports the development of neighborhood amenities, citing Obsidian trails, in southwest Redmond, as an example, "They put in a huge trail, an expansive trail system; there’s a great housing mix in there: single family, multi family, cottages, townhouses. And all of the master plans that we’ve approved lately are like that." Both agree the city must work with the Oregon Department of Transportation to fix traffic problems on South Highway 97. Endicott says he’s looking at short-term solutions; but eventually, phase two of the reroute will ease congestion, "There is a long-term solution, 30-50 years out, because it’s going to be so expensive; into the hundreds of millions." Fitch says preparations need to get underway now, for a South 97 Reroute, "I’m not looking at 30-50 years. What I think we need to do now is preserve the corridor on the east side of the tracks. Otherwise, that’s just going to be built up with new development. If we don’t do it, the south half of the reroute won’t happen." On public safety, and the recent hiring of more police officers, Fitch says, "Obviously, public safety is the number one priority of any community, but it also has to be in balance with everything else the community has to provide. I agree with the hiring of more police officers, but I don’t think you should strip every other department to do it." He would like to see voters decide on either a tax measure or special levy to fund police operations. Mayor Endicott says City Council already ruled out that idea, "We have looked at a property tax measure. We determined not to do that; one: the numbers in the poll we did were not supporting it." To listen to our full conversation with Endicott and Fitch, click HERE. And, for more coverage of the November mid-terms, visit our Election 2018 page. Both candidates are expected to take part in another public event Wednesday at 10 a.m., when Redmond Proficiency Academy students ask questions during a forum at the McClay Theatre, at 640 SW Evergreen, in downtown Redmond.